If you've ever had the pleasure of tasting Malort -- the polarizing urine-colored cult liquor from Chicago -- you understand that it has a, shall we say, unique flavor. Okay, let's be real, it's awful. Malort is a truly horrendous spirit that should probably only be pulled out for hazing rituals and inflicted upon sworn enemies. 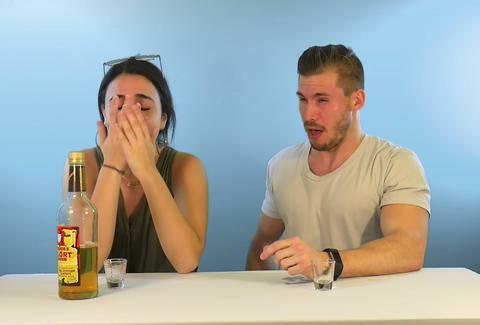 However, it's also the perfect booze to get people to try for the first time on camera, as you'll likely agree after watching this video. In the clip, pairs of human guinea pigs from all over the world sit down with bottle of Jeppson's Malort -- a variation of a wormwood infused Swedish liquor known as brännvin -- and pour themselves a shot of the storied bitter booze, a ritual that's become almost a rite of passage among Chicagoans and other brave souls. Some dared to sniff it ("It smells like dog"), but the truly entertaining bits come once it's down the hatch. Reactions range from pained grimaces and near-regurgitations, to delayed disgust once the after-taste set it. Though really, you've got to see it for yourself. Joe McGauley is a senior writer for Thrillist who's tasted Malort only once, and would like to keep it that way.